Hybrid World Adelaide 2017 (HWA) will be held for the first time from Wednesday October 4 – Sunday October 8 2017 at the Tonsley Innovation District south of Adelaide. But what is HWA? Is a convention? A conference? An educational experience? An expo? Hybrid World Adelaide is a digital playground for all ages and expertise. HWA is an exciting new technology festival and a first for South Australia. Across five days, a myriad of public activities, a conference and a development lab for new projects and inventions, explore the many ways the real and digital worlds are intertwined. The public program, which includes Retrospekt’s interactive retro gaming museum and many other attractions – League of Legends tournaments, She Flies and the HWA Drone Zone exploring the ins and outs of drone flying, Code Club, Minecraft, coding, more coding, the Maker Faire, the HWA LAN, sideshow alley, and much more. Bajo and Rad from Spawn Point will be in attendance at a number of sessions over the weekend. The ever popular Indie Games Alley will showcase numerous indie games from around the country. Many readers will have heard about the Zedtown: The Divided City event on Saturday, which is billed as a mashup of the Colour Run and Call of Duty. 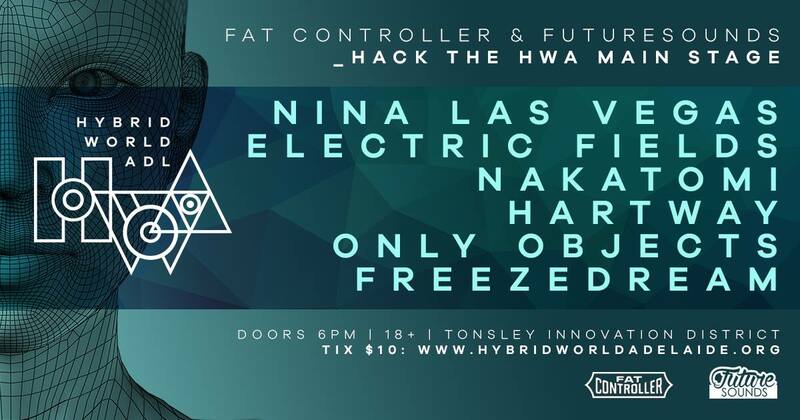 In addition, on Friday night HWA will be transformed into a music venue curated by Fat Controller and Futuresounds Adelaide. This event showcases a range of fan-favourite music artists, quite a few of whom would be familiar to attendees of our JoyPad music and gaming nights. Experience the Mega Driven delights of Freezedream, house, acid-jazz, and nu-disco trio Hartway, electro-pop drama of Only Objects, Adelaide’s electronic legends Nakatomi, pop and electronica by Electric Fields, and party favourite Nina Las Vegas. Please note that while much of the public program is free, some events cost a nominal amount – check the Hybrid World Adelaide website for specific details. The HWA Conference features over twenty-five speakers, all who are leaders in a number of disparate fields; biology, futurism, cybersecurity, technology, education, space engineering, robotics, innovation, academia, and much more. The conference promises much to learn and think about, but be aware that it is a ticketed event. The HWA Lab, with participants eligible for a share in $85, 000 of funding. If you’re reading this we suspect you’ll be interested in our interactive retro gaming museum. So, what to expect? For HWA we’ll have the largest retro gaming collection at an event ever seen in South Australia. With over thirty consoles and computers organised chronologically, visitors will go on a journey from the 1970s through to the modern era. Following the path through the museum you can experience the delights of Pong, Atari 2600, through to all the Nintendo, Sega, Sony and Microsoft consoles between then and now. In between those machines you know well, expect to see some you’ve heard of but never played before…and beyond that even more surprised. Prepare to be equal parts educated and entertained. And, of course, there will be daily high score and knock out tournaments. Check out these photos from AVCon 2017 for just a taste of what to expect. Hybrid World Adelaide promises to be a technological wonderland the like of Adelaide has never seen before. From the past to the present, and of course the future, expect to be entertained, challenged, educated, and enthralled. You can download the public program here, and of course do say hello to the Retrospekt crew during your travels through the event. Previous ArticleVisit AVCon 2017, Write A Haiku, Win Prizes!